INCLUDES: 20 place cards, designed by Andaz Press. FOLDED CARD SIZE: 3.5-inch wide x 2-inch high. Properties: Matte finish. Double-sided, digitally printed on high quality paper, with vibrant colors. Actual product color may vary slightly due to differences in monitor settings. PERFECT to use as place cards in a table setting, or on a dessert or buffet table. 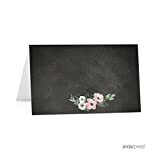 This entry was posted in Gardening Equipment and tagged 20Pack, Andaz, Cards, Chalkboard, Collection, Floral, Garden, Party, Peach, Place, Press, Printable, Table, Tent, Wedding by Lawn Advice. Bookmark the permalink.